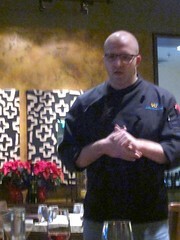 Executive Chef Kyle Schutte calls it "progressive comfort food." 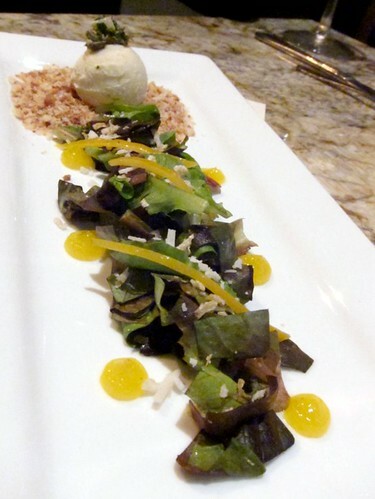 His background of training in the South is apparent in his cuisine, but Schutte was also the first chef in North Carolina to incorporate molecular gastronomy techniques into his cooking before moving to California to head the kitchen at Vu Restaurant. His pork belly dish is a good example. 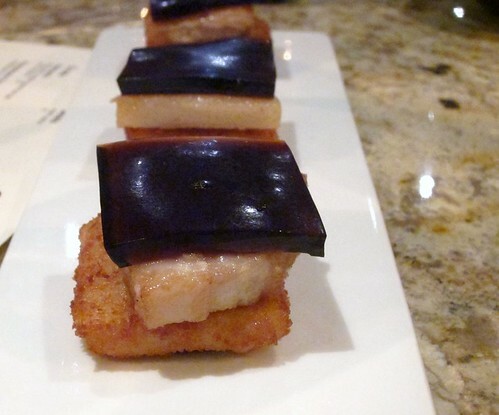 The pork belly is sandwiched by both sides: crispy grits on one and root beer jello on the other. Marina del Rey seems an unlikely place for this type of restaurant and I probably wouldn't have paid much attention to it if it wasn't for a recent media dinner held there. Our night started at the bar, where Luke the bartender made us some cocktails. 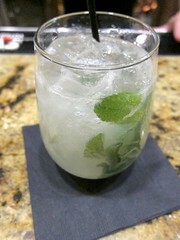 I started with the Mojo ($12) made with Death’s Door whisky, Dimmi, peppermint, honey, fresh lemon. Now, a bit on Death's Door whisky: it's a white whisky. A what now? Death's Door Whisky comes from a Wisconsin-based spirit startup. It is double-distilled so it's clear and is 160-proof (that's 80% ABV btw). 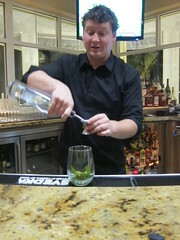 The Mojo had an herbal aftertaste - not sure if it was the white whisky or the Dimmi as I've never had either before. 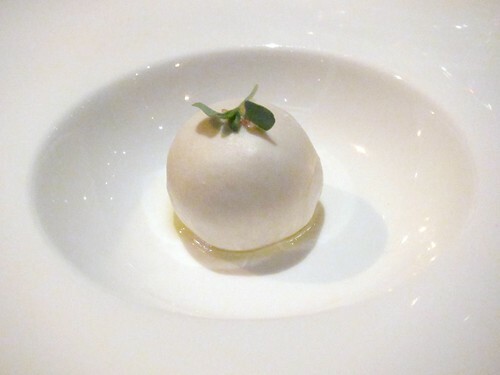 The cherry tomato is encased in the basil-infused mozzarella. Pop everything in for a nice little bite as the juicy tomato bursts inside your mouth. The creamy "caesar ice cream" was one of the most interesting things I had that night. This was an unusually fun and delicious salad, definitely worth a try. I really loved the waffle here. 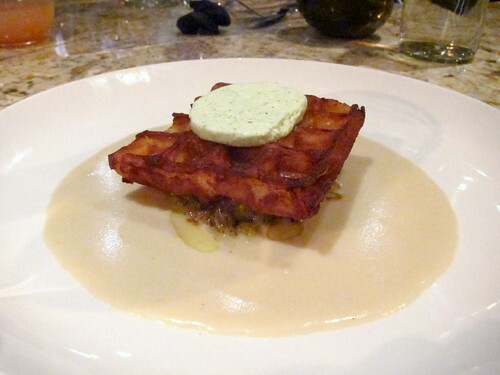 The crisped edges were a nice vehicle for the rich and savory interior, made even better by the leek butter. This was the dish I've heard the most about. The watermelon was sous-vided (is that a word?) then battered and deep fried. 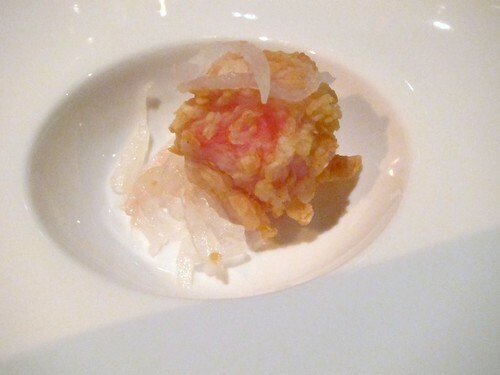 It was certainly an interesting texture, although I prefer eating fresh watermelon by itself. 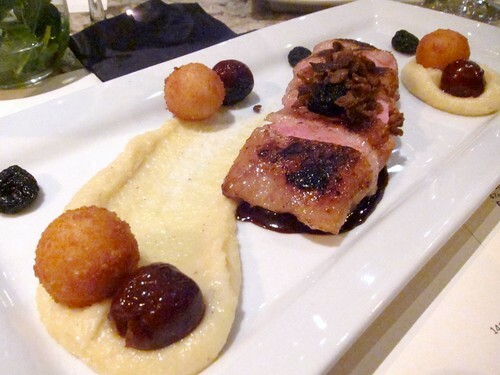 It's harder to do molecular tricks on the entrees, of course, so they consist of dishes like this King Cole Duck Breast with creamy goat cheese polenta, dried and fresh cherries, duck cracklins, chocolate-red wine reduction ($26). There were some interesting desserts as well ($8 each). 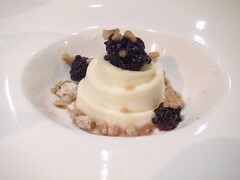 This was my favorite dessert; smooth and creamy yet not overly sweet. 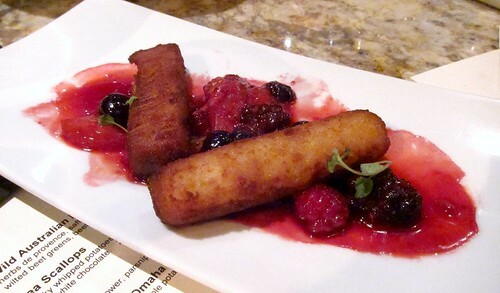 Another interesting one was the fried White Chocolate Polenta with frosted flakes, chambord-flambéed berries. 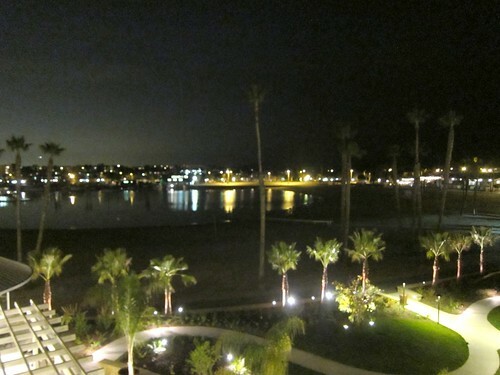 Vu isn't a restaurant I'd imagine finding in Marina del Rey but there it was. One of the few places in town heavy on molecular techniques and perhaps the only one tackling it with southern comfort food, with a marina view to boot. 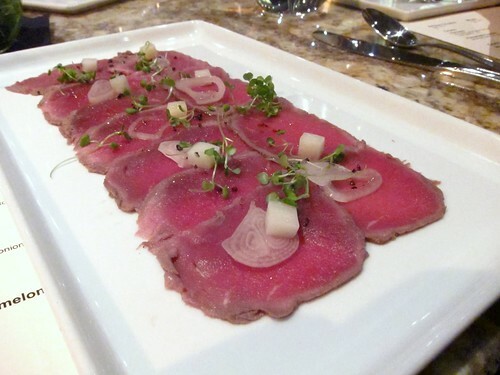 When my friend dined here, she complained of a couple things being overcooked, but I experienced none of that during this hosted dinner. The staff is capable of churning out a great meal, so let's hope that they can stay on top of their game on a regular basis. This restaurant looks great and all the dishes are mouth-watering. Thanks for the detailed review.